I've been to the AKC/Eukanuba National Championship dog show twice and have already scheduled this year's vacation around it. It's one of the country's biggest dog shows (probably second only to the Westminster Kennel Club dog show) and it's only a three hour drive from my house. So why am I talking about the show three months in advance? Well, a couple of Eukanuba-related things have come up lately that I think are worth sharing. 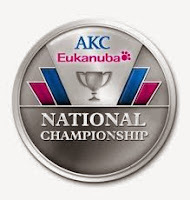 First off, there's not going to be an AKC/Eukanuba National Championship dog show this year. Don't panic! (I did.) There's still going to be a week of dog shows in Orlando this December -- it's just that Eukanuba isn't hosting it any more. For the next 15 years the show is going to be sponsored by Royal Canin. (To be honest, my picky dogs won't eat either dog food brands, so I don't care who's doing it.) Royal Canin has promised that the show will be just as wonderful as ever. The most notable difference will be the décor. It will change from Eukanuba pink to Royal Canin's signature red and gold. For information about other changes and to see the line up of events, check out this article from the Canine Chronicle. Why Won't People Do Things With Their Dogs? !